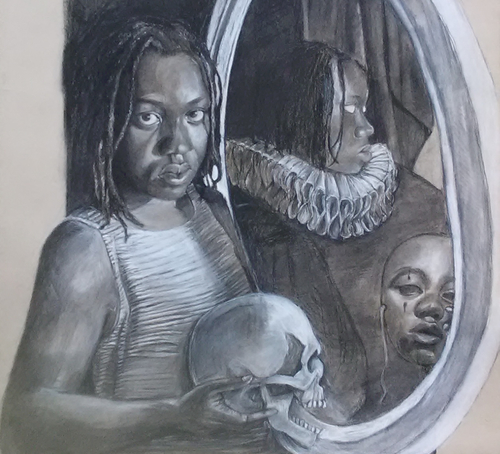 Six St. Andrew’s artists were honored with Scholastic Art & Writing Northeast Region awards including four Gold Key Awards, the highest recognition at the regional level. Seniors FaSade Fagoroye, Ava Fainberg, and Ashlynn Smith were the recipients of those top awards. Fagoroye, who won a Silver Key Award last year, won two of the four Gold Keys, one for Painting and one for Drawing and Illustration. Fainberg and Smith each picked up their Gold Keys in Drawing and Illustration. Fainberg also earned Honorable Mentions, one for Mixed Media and another for Art Portfolio. Smith, who won Gold and Silver Key Awards last year, added a Silver Key Award in Painting. Other honorees are Eunice Chang ‘20 with an Honorable Mention in Photography, Sarah Schwartz ‘20 with an Honorable Mention in Painting, and Grace Chang ‘20 with an Honorable Mention in Drawing and Illustration. Fagoroye, Fainberg, and Smith will advance to the National Competition by virtue of their Gold Key Awards. Those will be announced this spring.